Unless you’re GM, Ford, Ram, orToyota, the American pickup truck market is an uphill battle. The Nissan Titan has not made quite the impact the automaker had initially hoped, for example. Meanwhile, the car-based Honda Ridgeline has staked out a segment position of its own as a truck for city dwellers and suburbanites. As for Volkswagen, a truck for America is still in the pipeline but as we learned from VW Group CEO of North America Scott Keogh at Geneva, the automaker is still deciding its specifics. For example, will it be based on the same platform underpinning the Atlas crossover, an idea VW first told us about a few years ago, a heavily rebadged Ranger based on the new alliance between Ford and VW, or, perhaps most radically, an EV built on the upcoming MEB platform? "We are 100 percent looking at it," Keogh said. "I think we’ve done a good job of covering roughly 80 percent of the market today with our SUVs. But we are still looking at a number of different ways to do a truck. Doing so with Ford is a potential way of looking at it. Using an existing platform is another. Or, a third way is with electrification like Rivian." Keogh is, of course, referring to the Rivian RT1, an all-electric pickup truck built in America that’ll be coming to market in the near future. But launching a truck from a brand not normally associated with one is not so simple. "The trick I look out for is this:” Keogh continued. "Yes, there is a market opportunity. You have to make sure you have brand credibility that marries the opportunity. That’s why (the truck market) is so tough to get into. 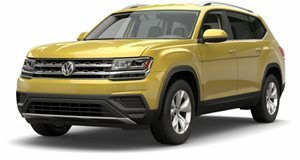 So I think we have to work out an angle that works for us.” And fortunately, VW has a past example of how an off-roader has, in many ways, become a family vehicle. "Another thing you gotta look at with trucks is what happened with SUVs,” he said. Keogh could not provide a precise timeline as to when a production truck, or let alone another concept, could come but chances are we’ll be seeing something appear sooner or later.